Being a Roman Catholic is, shall we say, a “package deal.” It is hard sometimes (even for life-long Catholics) to know what is optional and what’s mandatory in terms of both beliefs and practices. So, some Catholics, not knowing how to sort it all out, or simply not understanding, or perhaps even completely disagreeing with what the Church teaches about a particular thing, either miscommunicate or even deny certain teachings of the Church. Others do not participate in certain practices that are otherwise expected among faithful Catholics. 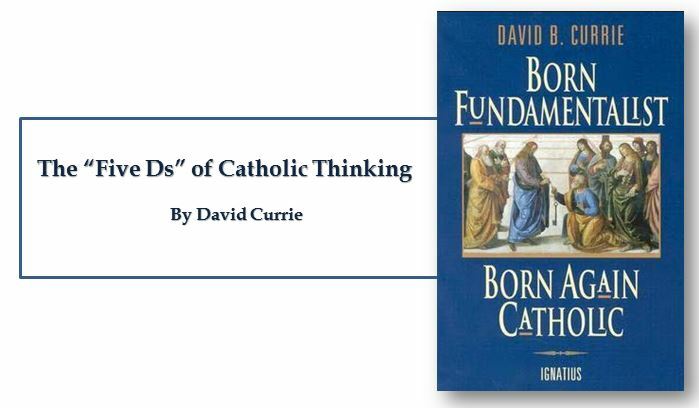 In the early weeks of my own journey, I was helped by the biographical testimony of David Currie in his book, Born Fundamentalist, Born again Catholic. Currie outlined five divisions in Catholic thinking with respect to where there is, and where there is not the freedom to opt out this or that Catholic belief or practice and to answer questions about why certain things have changed over time in Catholic teaching and practice. Currie was a seminary-trained preacher (Trinity Evangelical Divinity School, or TEDS), and so, like many of us, he provided his outline in the form of five words that all begin with the same letter; Deposit, Dogma, Doctrines, Disciplines, and Devotion. Here is an excerpt from Currie’s great book which includes his helpful description of each of these “Five Ds” and how they all work together. This will be vitally important to understand as I venture into Roman Catholic Marian Dogma (and other Catholic teachings) in future posts. Consider it a kind of methodological excursus which will be necessary to inform the how and why of Catholic thinking in future discussions. Change has occurred and will continue to occur. This was an important issue to me because I felt that no organization could be the true church if it contradicted itself on essential doctrines over time. I spent quite a bit of time thinking this over. Here are my observations. Since change is a very general term, let us separate it into two parts. There is a change that expands on prior truths without negating them, which I will call “development”. This type of change “unpacks” meaning inherent in the original truth so that the truth can be understood better. It defines. The other type of change reverses that which has been accepted originally. I will call that type “contradiction”. Contradiction affirms one day that “A” is true, and the next insists that “non-A” is true. There is one other distinction we must make. In thinking through this issue for my own edification, I came to see that the information of the church could be divided into at least five categories: deposit, dogma, doctrine, discipline, and devotion. I devised these categories for my own thinking, so I suppose the alliteration proves that I once studied homiletics. These are not the categories of the church herself, but merely distinctions that helped me clarify the idea of change. Deposit is that body of truth originally given to the apostles. In time, some of it was written into Scripture, while some of it remained in its original form of oral tradition. Protecting this deposit is a major responsibility of the bishops. The church teaches that nothing can be added to or contradicted within the deposit. For example, Peter had no authority to make up a new story about Jesus healing someone. General revelation ended with the death of John, the last apostle. The goal regarding the deposit is simply to conserve it with no change whatsoever. As an evangelical, I was surprised at how seriously Catholics regarded this responsibility. Dogma is that body of truth that has been affirmed by the councils of the church and the Holy See of Rome. The further explanation, definition, and development of the concepts within the deposit, as well as the deposit itself, are contained within dogma. Once dogma is declared by the bishops, it can be further developed but never contradicted by future doctrine or dogma. I could find no case within Vatican II where earlier dogma was contradicted. Dogma is usually declared in Council or by the Pope to combat a particular problem. For example, the dogma regarding the divinity of Christ was not declared by counsel until teachers in the early church questioned that truth of the deposit. The deposit always contained the truths of Christ’s divinity, however. The Council of Nicaea certainly did not invent new truth about Christ’s nature as God-man. They merely clarified the truth already believed. So, dogma can be developed. Doctrine is the development of truth on the basis of the deposit and dogma. Doctrine can develop and even contradict itself over time because it is largely the thoughts of people. It has not been officially declared true or false by the church. This is the realm in which most theologians deal, on the cutting edge of the Church’s thinking. One Catholic theologian may totally contradict another equally Catholic theologian. They both can’t be right, yet the church is withholding her judgment on that particular issue. More thought, more wisdom, or more time may be needed before the church decides which formulation of that particular doctrine is fully consistent with the deposit and dogma. Doctrine pushes the envelope of the Church as far and is only slowly if ever, accepted as dogma. Otherwise good, careful evangelical scholars make the mistake of taking doctrine as the unchangeable teaching of the Church. When they see it changing over time, they draw the wrong conclusions. The reason is relatively simple. The ultimate authority in most evangelical churches of what is truly biblical rests with those men teaching at the seminary from which that church draws its pastors. If the pastor and board get into a theological tussle over some issue, it is not unusual for a seminary professor to be called in to moderate and to decide the truth in question. As a result, when these same evangelical scholars attempt to understand what is really going on inside the Catholic Church, they make the mistake of looking to their counterparts in the Catholic seminaries as the authorities on Catholic theology. It seems that every evangelical pastor has at least one anti-Catholic book in his study. When I informed my pastor of my intentions, he lent me a book written by a professor at TEDS who is now at another institution. This truly fine scholar stumbled rather dramatically in his research because he made precisely the mistake of considering professors as the authorities. In the Catholic Church the professor is not the final arbiter of truth; the bishops and the Pope are. The church’s pronouncements are very accessible, but most evangelicals don’t ever read these documents, much less footnote the, in their discussions of what Catholics teach. You do not know what Catholics teach unless you go to the sources that they themselves accept as authoritative. Disciplines are those rules that govern the everyday life of faithful Catholics. This area has seen the most change (contradiction) in our generation, and it is this very visible area that people usually point to when they accuse the church of having changed since Vatican II. For example, in the past, Catholics were required to fast on the Ember Days, 12 days each year. They are no longer required to do this. This is a bitter pill for evangelicals to swallow, but disciplines are supposed to be mandatory once in force, yet some of them may be changed over time. It would have been wrong for a Catholic to ignore the Ember Days fast in the 1950s. Yet now it is no longer necessary to fast on the former Ember Days (except Good Friday) because this discipline has been rescinded. Why? It has to do with obedience. As Christians, we are under the authority of the apostles’ successors, the bishops. They are responsible for making rules that will enhance the spiritual life of their flock. Although that goal never changes, the rules of discipline may. When the bishops decide an existing rule is no longer effective in helping people worship God, or when they determine that a new rule would be effective, it is a Catholics duty to obey them. This is certainly in line with the promise: “Whatever you bind on earth will be bound in heaven, and whatever you loose on earth will be loosed in heaven.” Disciplines by their very nature are going to be developed and contradicted over time — bound when the need arises and loosed when appropriate. This article is excerpted from David Currie’s book “Born Fundamentalist – Born Again Catholic,” pages 83-87, Ignatius Press, 1996.